This valuable booklet is freely available to all our members and may be presented to medical professionals at A&E. All medical issues relating to emergency care are also summarised here, on this web page. Acute idiopathic gastric dilatation can occur. Instances of abdominal discomfort, pain, bloating /distention and/or vomiting (unusual in PWS) or odorous belching should be evaluated. High risk for life-threatening gastric inflammation, necrosis or rupture. Risk increases if slim and/or following an episode of binge eating, gastritis or recent weight loss. Common issues with gastric motility/ gastroparesis, constipation, lack of vomiting, and repeated weight gain and loss can all contribute to serious GI problems. Pain may be absent or general unwellness reported rather than localised pain (high pain threshold.) 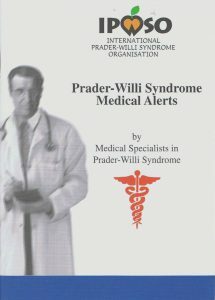 Signs of inflammation or infection, such as fever or changes in vital signs may be absent (altered temperature regulation in PWS.) GI issues have resulted in 10% of deaths (perforation, distention, obstruction and infection.) An abdominal xray or scan should evaluate distention and an endoscopy can further determine cause, but an NG tube for decompression or emergency surgery may be necessary. 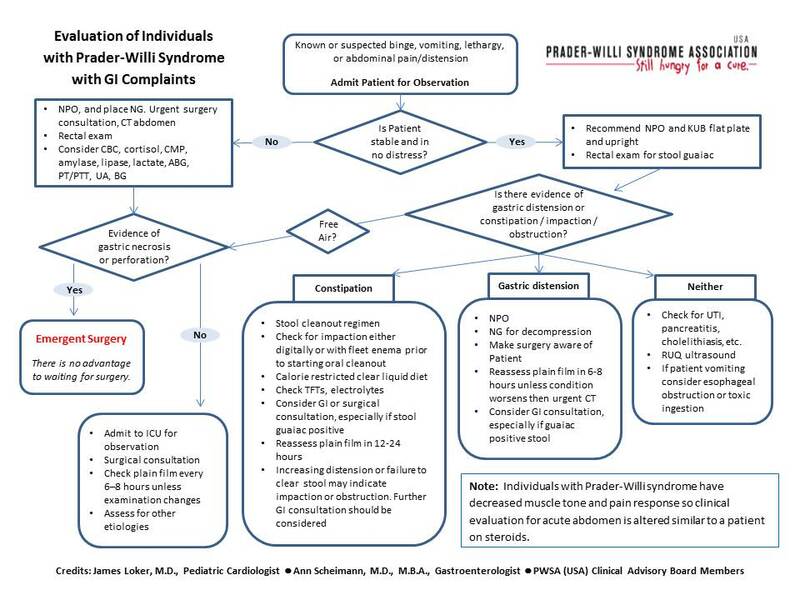 Please see the GI evaluation algorithm chart for guidance on assessing GI complaints. 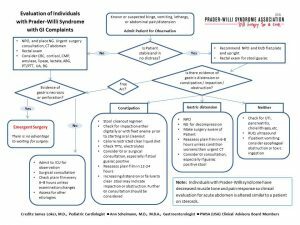 Medical Report: Recognising Gastric Dilatation and Associated Risks in Prader-Willi Syndrome – Linda Gourash, MD, Janice Forster, MD, Pittsburgh Partnership. Or to download a copy, click here. Risk may be increased for respiratory difficulties, possibly complicated by hypotonia and central, obstructive or mixed sleep apnoea. Ventilatory control responses to hypoxemia and hypercapnia are altered in PWS; aspiration and reflux problems are common in infants. Sleep related breathing problems occur more frequently with young age and in cases of severe hypotonia, narrow airway, morbid obesity or where prior problems exist, i.e. respiratory failure, asthma and hypoventilation with hypoxia. A sleep study should be considered prior to surgery or sedation, particularly if patient has any of above, history of excessive daytime sleepiness, snoring or chronic respiratory infections. Some studies suggest an increased risk for CAI in PWS patients whilst others have found cortisol responses to be normal. Since the possibility of an increased prevalence of CAI exists, screening is recommended either during illness (cortisol and ACTH levels) or using a stimulation test. The ACTH stimulation test has 95% sensitivity for diagnosing impaired adrenal function, although mild CAI may be missed. Some doctors believe that unless CAI has been ruled out, short-term hydro-cortisone treatment may be indicated during acute illness. High risk of choking in PWS – resulted in 6 to 8% of deaths. “Potential causes of increased choking in PWS include poor oral/motor coordination, poor gag reflex, hypotonia, hyperphagia, decreased mastication (chewing) and voracious feeding habits,” Stevenson et al, 2011. Reflux and aspiration problems common in infants. Thick saliva and reduced flow are common, so hydration needs to be mantained. Provide softened foods, supervise eating, encourage chewing and eating slowly. Possibility of unusual reactions to anaesthetics. Close monitoring of general anaesthesia with risks specific to PWS carefully evaluated means that the majority of complications come from less well supervised conscious sedation. Prolonged and exaggerated response to narcotics/ sedatives can occur. Perioperative concerns of PWS include OSA/CSA, decreased pulmonary reserve secondary to chest wall deformity (i.e. scoliosis), hypotonia, obesity and primary myocardial involvement. Plus, …. Plus, an abnormal response to hypercapnia and hypoxia, risk of PE, a narrowed oropharyngeal space, hypoplastic dental enamel, thick saliva, an increased risk of gastric aspiration, convulsions, disturbances in thermoregulation, difficult IV access, and the possibilities of CAI, hypothyroidism, diabetes mellitus and glucose intolerance. Due to hyperphagia, it should be assumed a patient with PWS has eaten food unless confirmed otherwise by a caregiver. Risk for complications increases with young age. Gradual return to drinking and eating recommended due to high choking risk and possibility of slow GI function recovery. Outpatient procedures may require overnight observation due to prolonged effect of anaesthesia and effects of pain medications. Please see Medical A-Z section for more detailed information on anaesthesia, post-operative monitoring and medicine contraindications. The increased risk for disrupted temperature regulation or hyperglycaemia /diabetes mellitus in PWS should be considered with some medications. Water intoxication has occurred in relation to some medications with antidiuretic effects (including some neurotropics) and antidiarrhoeal medications may cause severe colonic distension. Water intoxication can also occur as a result of excessive fluid intake when compulsive water drinking related to hyperphagia becomes a problem. Concerns include: possibility of hormone imbalances in PWS affecting electrolytes, speculation about SIADH risk and medications frequently used in PWS include neurotropics and antidepressants. Check electrolytes and monitor for hyponatremia. Please see Medical A-Z section for more detailed information on medicine contraindications. Some people with PWS do not vomit and therefore vomiting may signal serious illness, blockage or rupture in these people. Lack of vomiting can also be of concern during episodes of gastric illness, food poisoning, or if poisonous substances have been consumed. This needs to be considered in treatment plans and where emetics are usually used, they may be ineffective. Some people with PWS are able to vomit, although it may occur less frequently. Reflux / rumination are commonly seen and controlled by a different mechanism to true vomiting. Normal body temperature may be altered in PWS (lower or higher) and poor temperature control means fever may either be absent or higher than would be usual with infection or during illness. Hyper and hypothermia can occur. Hyperthermia may occur during minor illness and as a complication of anaesthesia. All individuals are at risk for hypothermia associated with impaired peripheral somatosensory and central thermoregulation. Some may be more susceptible to episodes of sustained hypothermia, particularly in middle age. Preventative measures and close monitoring of vital signs are recommended. Individuals with PWS have an increased appetite from around age 4.5yrs and become hyperphagic from around age 8. They may rarely feel full and may be consistently preoccupied with food. Supervision around food is necessary. If unsupervised access to food is gained they may quickly ingest large quantities leading to rapid weight gain which is difficult to lose and a risk of choking, gastric necrosis or rupture. Storing food securely out of sight and mind is recommended. Pain signalling is often impaired and can hide the presence of injury or infection. Pain may not be felt until severe. Complaints should be taken seriously and subtle changes in condition or behaviour noted. It also needs to be taken into consideration that a person with PWS may not be able to localise or describe their pain well. Any abdominal pain should be investigated, particularly if there is a chance the person with PWS has consumed unsavoury or unknown quantities of food.